On the front cover, we can see a man who is singing like a rock star. 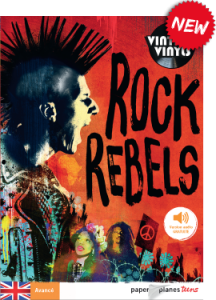 We can actually see some people who demonstrate for the peace and love and at the top of the page we can see the title « Rock Rebels ». I enjoyed reading this book because the stars are real and various. This book is brilliant because the intrigue is ingenious and it’s about lots of people. One negative point is the first chapter which is boring to me. I didn’t like it because it wasn’t fictitious. I wished it would be shorter. I thought the book was only about Rock and Roll stars’ lives. I wished there were less historical explanations and more details about the biographies.